One of the perks that come with the job of being Head of State in any country is the palatial office (or residence). 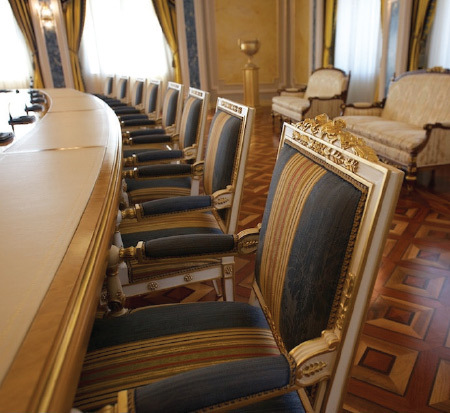 In Kazakhstan, the President of the nation gets a plush office with a fabulous view, housed within a grand building known as the Ak Orda Presidential Palace. It looks grander than the White House, but maybe not as stately as Buckingham Palace! Kazakhstan is a young sovereign nation that declared its independence from the former Soviet Union on 25th October 1990. Its leader Nursultan Nazarbayev has been President since Independence. Born in the Year of the Dragon, President Nazarbayev comes across as a visionary who is trying hard to bring the country into the 21st century, and observing the new buildings that have been put into place, it looks like his administration knows quite a bit about using symbols and feng shui to generate strong chi for the nation! 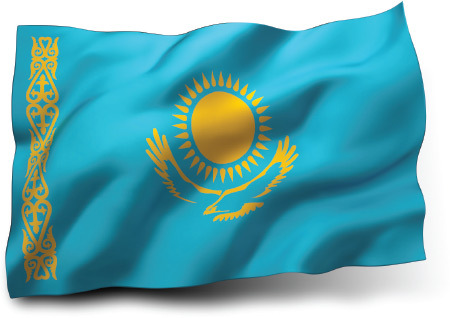 LOOK AT THE FLAG of Kazakhstan. It was completely redesigned in 1992 and it features the mighty Steppe Eagle with wings soaring wide to symbolise freedom, power, leadership and flying beneath a Golden Sun into a bright future. The sun has 32 rays of light that signify prosperity and abundance. The blue background of the flag represents blue skies, although to the Turkic peoples who are natives of the country, it also has religious significance. Here the sun, which is a source of life and energy, exemplifies wealth and plenitude. The left side of the flag features their national ornamental pattern “koshkar-muiz” in gold – and this stands for “the horns of the ram”. 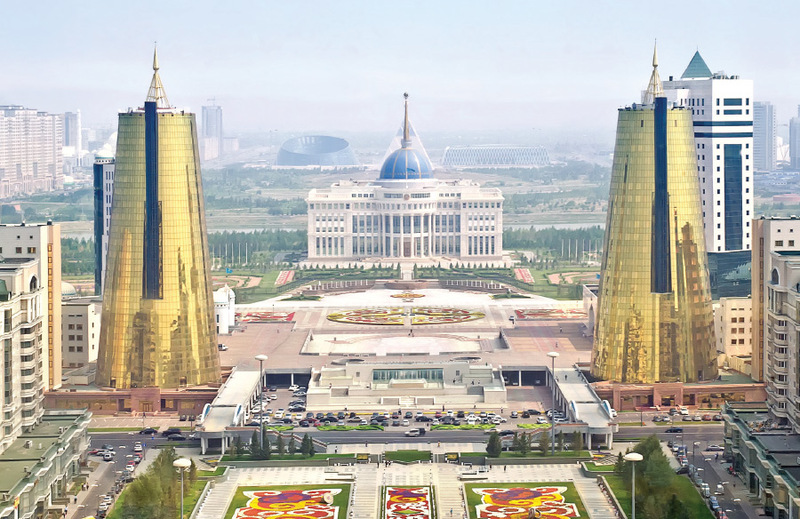 Nazarbayev built many new buildings, and many feature a great deal of powerful symbols to connote strength, power and prosperity. 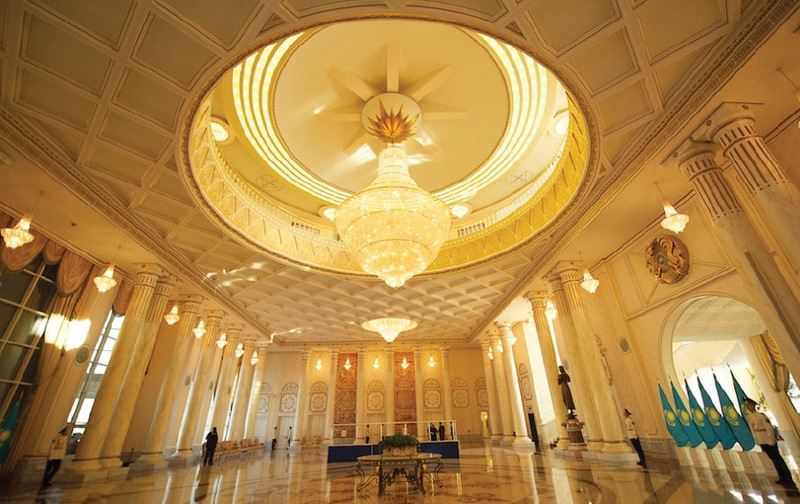 Here we look at the grand palace of Ak Orda, which was inaugurated in 2004. This enormous seven-story building is 80m tall and sits auspiciously by the banks of the Ishim River. 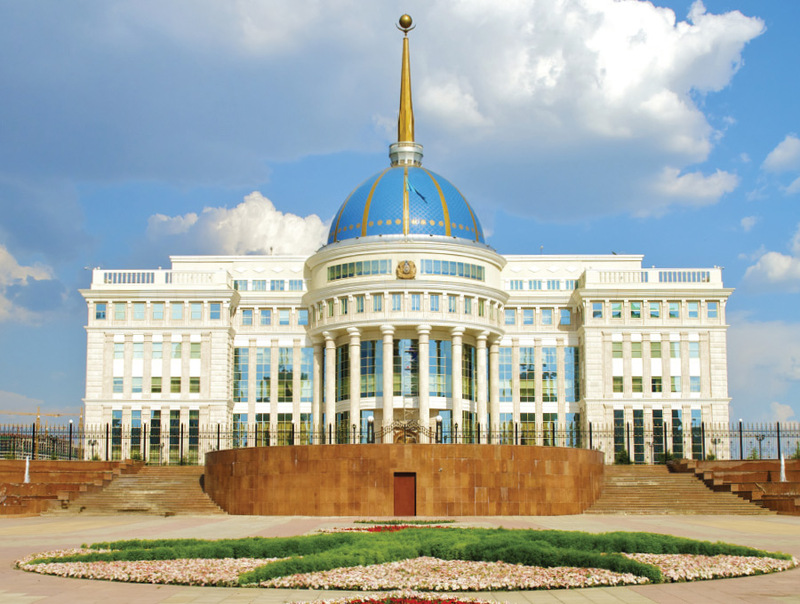 Referred to as the “White House of Kazakhstan”, the architectural design borrows inspiration from iconic buildings of government in the United States. At a glance, the Ak Orda Palace features a large dome like that of Washington’s Capitol Hill and has a pillared semi-circle frontage similar to the White House. Since the inauguration of the palace, Kazakhstan’s economy has grown sharply upwards. Today, it is the largest economy in Central Asia, possessing enormous oil reserves as well as minerals and metals. In 2015, Kazakhstan secured 2nd position in the Central and South Asia regional ranking of the 2015 Global Innovation Index (GII) released by World Intellectual Property Organization (WIPO) with Cornell University and INSEAD France. 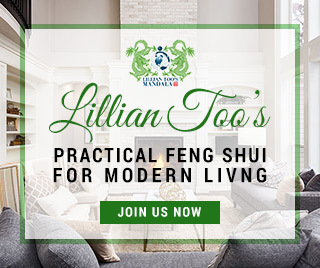 We will try to interpret some of the feng shui features that appear to have been incorporated into the Palace interiors and exteriors. It will be interesting to see if the winds and waters planned will bring good fortune to the young nation of Kazakhstan. Any property that enjoys close proximity to a stream of flowing water is blessed with good energy. Water symbolises wealth and prosperity in feng shui! The location for the Ak Orda Palace was specially chosen so that it could take advantage of the natural flow of the Ishim River. Here, the designers of the building made very sure that the palace is hugged by the curve of the Ishel River. In classical feng shui, this is the “Jade Belt”, a most auspicious formation in water feng shui! 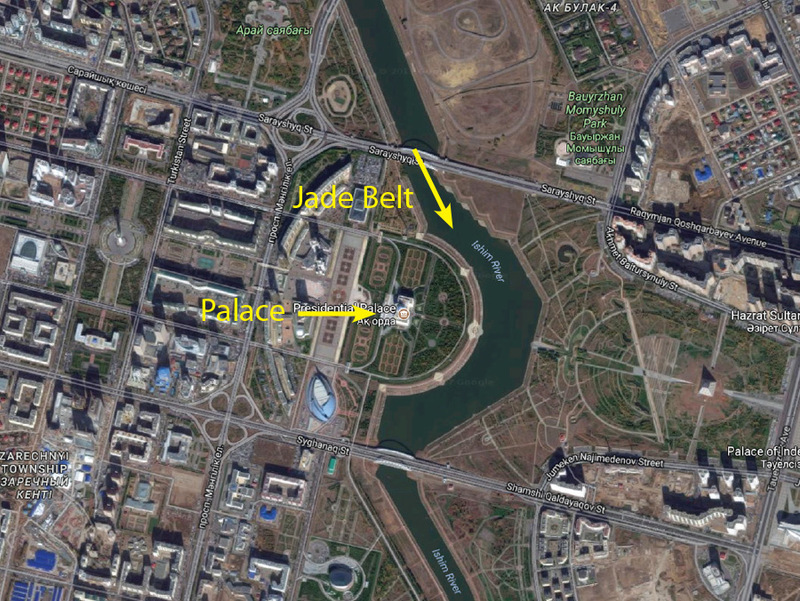 Look at this aerial photo taken from Google Earth – you can see that river is green in colour just like jade. Judging from how the water enters and leaves in such distinct directions, we can tell that Water Dragon feng shui formulas were taken into account when designing the orientation of this palace. 2 The Eagle on Top, and the Blue Dome signifies the Sky! Normally, a blue roof on any building is considered to be an inauspicious feng shui feature because water at the zenith is a sign of danger. But here, the blue dome signifies the vast open skies. This is mentioned in all official literature describing the dome so that it is perceived in the correct light. The sky represents the limitless and endless opportunities for the nation to accomplish greatness – thus transforming this feature into a positive one for the palace! The designers were careful not to cover the entire roof of the palace with blue – only the dome is blue. To ensure that blue is not misinterpreted as ‘water’, the top of the Dome is adorned with the Sun and a mighty Eagle in full flight. Both these auspicious symbols rest above a golden obelisk. Quite incredible! Grand chandeliers hang from the ceilings throughout the palace. 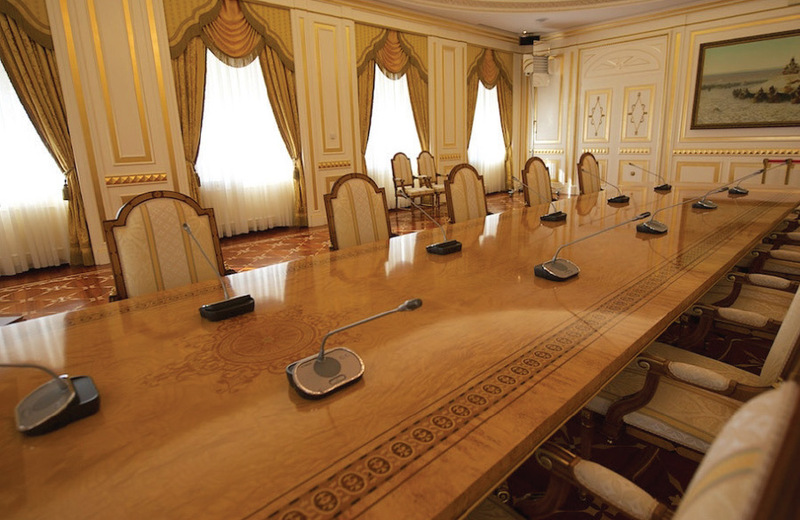 The board rooms feature Russian-style opulence. Ak Korda Palace stands at 80 meters tall, and is built with seven levels. In religious cosmology of all traditions around the world, seven is the number associated with the seven divisions of heavens or “celestial realms”. These define the abodes of immortal beings who live in the sky alongside the Sun, Moon and Stars! 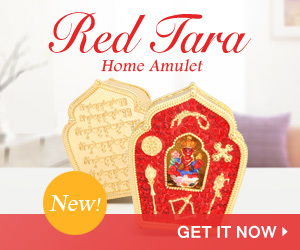 Seven is the number connected with the seven celestial bodies of astrology, which play a role in shaping one’s destiny. The seven stories transform the building into a celestial abode where Gods and Protectors live. 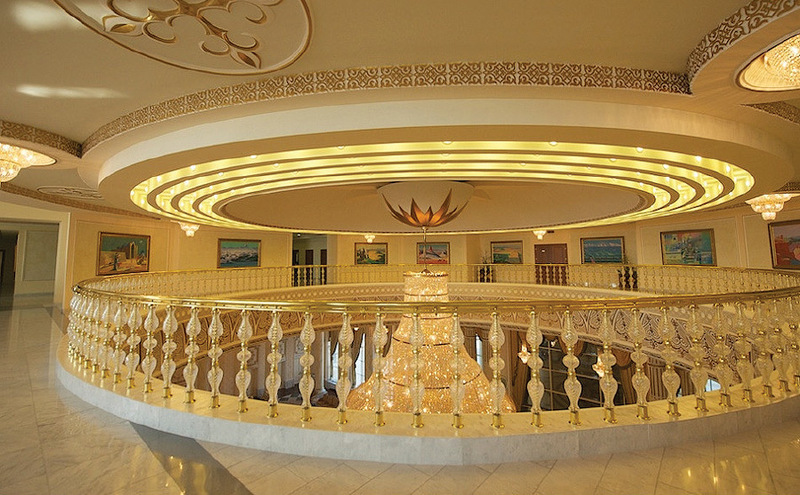 The Ak Orda Palace has opulent furnishings and precious materials. A generous amount of gold and twenty one different types of marble were used throughout the interior design of the abode! The interiors are exceedingly grand as can be seen from the photos reproduced here. Marble symbolising earth energy and Gold bringing prosperity and abundance is generously used! Everything within connotes a sense of wealth, power and strength. The exterior of the palace was given a lot of thought. From the front, it can be seen the palace sits on slightly elevated ground, known as the “Emperor’s Throne Position”. Two large gold towers are positioned to stand as protective pillars; they act as “guardians” of the palace. In the picture they look very large, but in reality they are smaller than the palace. The front of the palace has a large Bright Hall to collect the chi that accumulates here. A lovely fountain water feature completes the courtyard along with beautifully manicured gardens that are designed with the Rams Horn motif.